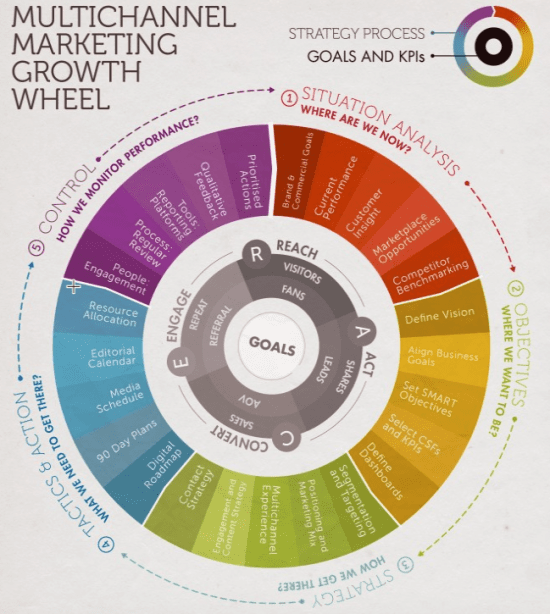 What are the essential parts of a marketing plan template? A marketing plan is a strategic document which specifies your organization’s target markets, marketing objectives, programmes and activities to achieve them, timescales and the resources to be utilized, according to defined budgets. Our new, free download detailing the different types of marketing plans will help you structure different types of plan and gives recommendations on how to make them effective. This download and our other free templates are for anyone who wants to improve their knowledge of marketing planning with a few to gaining more senior roles. A marketing plan in a large organization may integrate a number of plans, specific to individual parts of the business. It is practical planning that takes place at divisional, business unit or individual company level. The purpose of a marketing plan is to ensure that marketing activities are relevant and timely to achieve an organization’s objectives. It’s a plan defining a sustainable competitive position and defining the resources necessary to achieve it. When to use a marketing plan? A strategic marketing plan outlines the overall strategy within a market, connecting customers, competitors and what the organization is capable of achieving. It is typically created at divisional or company level. An operational marketing plan outlines the marketing mix strategy that will be used to gain an advantage in a market. It typically focuses on products; market segments and how marketing communications and campaigns achieve targets defined in the strategic marketing plan. It usually has separate sections covering tactics for customer acquisition and retention which will sometimes be covered in separate plans in larger organizations. What should be included? / How should it be structured? To make sure your marketing plan has all the essential features, I recommend the SOSTAC® structure developed by PR Smith—Dave Chaffey’s co-author of the printed book Digital Marketing Excellence. SOSTAC® is a great framework for structuring business, marketing or digital marketing plans since it’s relatively simple and logical, so it’s easy to remember and to explain to colleagues or agencies. SOSTAC® is a strategic planning process framework that gives you a clear structure to work through to create and manage your plan. Larger organizations with clearly defined management structures and a wealth of resources will make use of marketing principles very differently from smaller organizations. Such differences between large and smaller organizations tend to be reflected in the development of marketing plans. When establishing a small start-up, marketing planning is an essential element. A small number of these businesses launch and grow, but for those that are successful, a strategic marketing approach will ensure continued development. 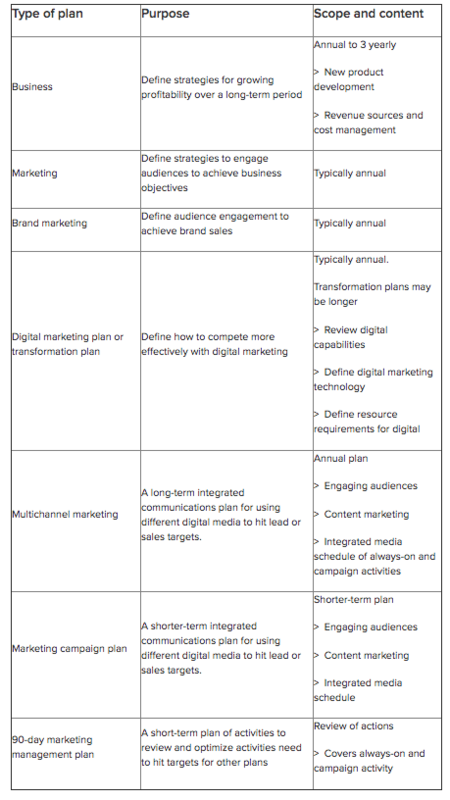 Although the techniques for marketing planning may vary between different sizes and types of organization, the outcome is always the same: to implement the objectives, strategies and activities in order to gain an advantage. How does a marketing plan relate to other plans? A marketing plan should not be formulated or used in isolation; it should be informed by the corporate objectives identified in your organization’s business plan. Integrated with a marketing plan may also be a digital marketing plan, multi-channel marketing plan and a campaign plan, for example. The marketing plan informs these plans and vice-versa. An effective marketing plan will ensure the integration of activities, the scheduling of requirements, distinguishing responsibilities and the provision of benchmarks for measuring success. Different organizations will utilize differing plans, covering different areas and timeframes. What is crucial in a business is that the plans being utilized, the timeframes allocated and how they integrate with each other are collectively established.